A startup is an entity that is headquartered in India which was opened less than seven years ago and has an annual turnover less than ₹25 crore (US$3.9 million). Ministry of HRD, Department of Science and Technology have partnered in an initiative to set up 75 Startup support hubs in the National Institutes of Technology (NITs), IITs, IISERs and NIPERs. The Reserve Bank of India has assured to take steps to help improve the ‘ease of doing business’ in the country and contribute to an ecosystem that is conducive for the growth of start-up businesses. Startups are facing many challenges and hurdles despite commitment by the Government to provide all the support and finance. The biggest challenge before success of campaign is parameters of Ease of doing business, corruption, availability of skilled labor among others. Startups find it difficult to have access to credit. Attracting investors to fund ventures or getting loans from banks are perennial problems for startups. Despite all the commitment, Banks are not giving loans to startups without prior credit history. Many times despite raising sufficient initial capital, startups find it difficult to survive as they can’t match revenue and burn rate mostly because of changed economic factors. Finding right skilled human power is another biggest challenge before startups. India’s need of skilled labour is so huge that National Skill Development Corporation (NSDC) has been mandated to skill 150 million Indians by 2022. For a startup, it is difficult to attract and hire talent and skilled workers, since they cannot match salary level given by large, established companies and also cannot offer job security on long term basis. Startup failures are looked down upon. Failures are not met with encouraging advices in most of the cases. People are sensitive towards risks and rewards and Indian economy which is highly price sensitive, worsens the situation. Right kind of mentorship is not available. Available mentorship and skill enhancement may not be accessible in all the cases. So though someone has potential to start something and may be that idea is really revolutionary but if that doesn’t meet right guidance to turn it into a successful business then that idea remain irrelevant. Huge, diverse demographics makes it really hard to capture consumer’s mindset in Indian Market. Literally after every 30-40 km region, one can find change in taste, traditions and habits. If a firm is able to capture consumer mindset, it cannot cater to all of their needs. Most startups get stagnant in figuring out strategies and they eventually shut down. Location is another hurdle. Location depends on investment activities also. Startup India has also formed a relationship with TAVtech Ventures, a nonprofit educational organization that is establishing a platform for collaborative innovation between US, Israeli, and Indian students to launch start-ups. Under the scheme, a group of start-ups will acknowledge an MOU with the prestigious institutions and will also establish the start-up centers in the campus. NIT-Silchar is one of the institutions of the country to have joined the program. IIT Madras is also linked with Startup India campaign. The institution has been successfully managing the IITM Research Park which has incubated many start-ups. In last 2-3 years, there has been increase in startups in versatile areas like retail, food delivery, consulting, e-commerce, medical services, delivery services, fitness among others. On an average 800 startups are born every year. Startups are evolving in terms of product capabilities, networking, taking calculated risks venturing into new spaces. Delhi NCR and Bangalore has highest number of startups predominantly because of economic activities of population of both cities. Cities like Jaipur, Chandigarh, Chennai, and Jodhpur are witnessing increasing startup activities. Successful startup like Zo rooms was conceived in small city like Jodhpur. Southern States like Karnataka, Kerala, Andhra Pradesh and Telangana have shown better results than the rest of the country in terms of their policies implementations for supporting startups. These states have focused on improving infrastructure, especially in the Tier-II cities. Launch of "Kerala IT Mission", which focus on fetching ₹50 billion (US$780 million) in investments for the State's startup ecosystem is a great example Kerala has made India's first telecom incubator Startup village in 2012. The state also matches the funding raised by its incubator from Central government in 1:1 ratio. Telangana has launched the largest incubation center in India as "T-Hub". Andhra Pradesh has allocated a 17,000-sq.ft. Technological Research and Innovation Park as a Research and Development laboratory. It has also created a fund called "Initial Innovation Fund" of ₹100 crore (US$16 million) for entrepreneurs. Madhya Pradesh has collaborated with the Small Industries Development Bank of India ISIDBI) to create a fund of Rs. 200 crore (US$31 million) for Startup India campaign. Rajasthan has launched "Start-up Oasis" scheme. Government of Odisha organised a two-day Start-up Conclave in Bhubaneswar in November 2016. The main objectives of the event was to motivate youth towards entrepreneurship, showcase the start-up ecosystem in Odisha and attract more start-ups to the state. Startup India aims to promote bank financing for start-up ventures to boost entrepreneurship and encourage start ups with jobs creation. 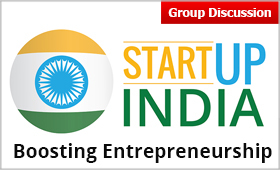 Startup India campaign was first announced by Prime Minister Narendra Modi from the Red Fort in his August 15, 2015 address to the Nationa Startup India was inaugurated on January 16, 2016 by the Union Finance Minister, Mr. Arun Jaitley. Around 40 top CEOs and startup founders and investors attended the event. Startup India campaign was organized by Department of Industrial Policy and Promotion.